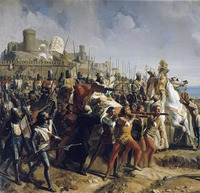 The Battle of Montgisard was fought between the Ayyubids and the Kingdom of Jerusalem on November 25, 1177. The 16 year old King Baldwin IV, seriously afflicted by leprosy, led an out-numbered Christian force against the army of Saladin. The Islamic force was routed and their casualties were massive, only a fraction managed to flee to safety.